Designed to keep one’s identity hidden; these masks were used for many years as masquerade masks and Mardi Gras masks, so the public wouldn’t recognize the individual wearing it. Often referred to as the Venetian mask of Italy these masks were originally banned but later the ban was resigned and that day became a Carnival of Venice (Carnevale). This black feminine mask is made from hard plastic and measures to about 9″ tall and 5.5″ wide, it has beautiful black sparkled designs painted right on it! It also includes peacock feathers that measure to about 4″ off to the side of the Mask. 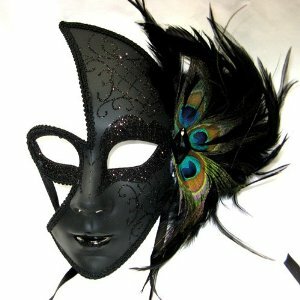 It would be great to wear in any masquerade ball or as an additional piece to a lovely costume.